SO the racy pictures that radio personality MisRed shared last week were meant to whet people’s appetites for a music video by Jah Prayzah called Kune Rima in which she features. MisRed’s image with legs split atop a vintage car that she shared on her Instagram account shook the Internet last week. As if that was not enough, on Sunday and the better part of Monday, another controversial picture of her and Jah Prayzah, cheek to cheek, also surfaced and sent tongues wagging. Thereafter, speculation was rife that the two were now an item. Could MisRed have snatched Jah Prayzah from his wife, Rufaro, many asked. Gossip monger, Tatelicious – whether she knew of the video or not – also played a role in convincing people that the two were indeed an item through her posts. All this, it has emerged, was a marketing gimmick to promote the Kune Rima video that was released on social media yesterday. The song is off the Chitubu album whose track, Dzamutsana, also got rave reviews from fans. On the video, the sassy MisRed plays the role of Jah Prayzah’s love interest, a role she executed very well as the chemistry between the two was so convincing. 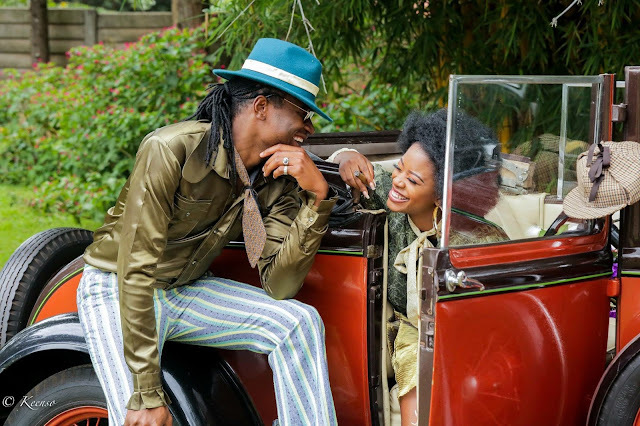 Taking a vintage theme, the music video is set perhaps in the 1960s with two vintage cars and both parties appearing in vintage outfits, which is something fresh for Jah Prayzah. The visuals have the fingerprints of one renowned videographer Vusa Blaqs and although the credits come at the end (Umsebenzi kaBlaqs), from the beginning of the music video, it was clear that he was behind it. No wonder Blaqs, on Enzo Ishall’s sub-standard 50 Magate music video, had to make a disclaimer saying, “Not Umsebenzi kaBlaqs” at the beginning of the video. The Kune Rima music video that had already raked up 20 000 views after just four hours of its release yesterday, is a perfect antidote for people who are in love. It could not have been released at a better time as it is setting the mood for Valentine’s Day. What has got people talking again is the end of the video where the two seem to kiss under the shade of their silhouettes. Did they really kiss, most have been asking. MisRed on her part, said she had a great experience shooting the music video and thanked Blaqs for taking her out of her shell.